I am a Delhi based Facilitator and Behavioral Counselor. My work involves supporting people to identify their strengths and create more happiness and success. After completing my course in Electrical Engineering I started my career as an AutoCAD Trainer. I worked with companies like Media Video Ltd., Johnson Controls and ET&T and recognized my passion for training. During a telephone counseling volunteering assignment I happened to save a girl’s life and this incident motivated me to move forward with the BPO leader GECIS and then carry on my journey in the field of Professional & Behavioral Skills Training. I worked with Equinox BPO (now, Oracle BPO) for about three years as a Lead Trainer and moved on to become Assistant Manager OD at Aegis BPO. I gained further experience in Instructional Designing and Life Coaching and worked with organizations like Accenture and NIIT. My last worked organization was Jaipur Rugs as Senior Manager- Talent Development. I studied Psychology at Annamalai University and did Post Graduate Course in Training and Development from ISTD. I also completed Courses in Instructional Designing, Counseling and Coaching. I got trained in TA (Transactional Analysis) by Dr.Pearl Drego and completed my advance course in NLP (Neuro Linguistic Programming) from Dr. Richard Mchugh. In my personal life, I enjoy singing, reading Tarot, doing Voice Overs, laughing hysterically with close friends and practicing creative healing. After 15 years of living my life happily, one day I felt as if there was something strange happening to me. I felt miserable and didn’t feel like talking to anyone. I could not sleep or eat properly. Life became gloomy and dark. It took me six years to know that I was suffering from Bi-polar disorder. Life was tough and full of darkness and fear. There were times when I just could sleep for three days in a row. Sometimes I would feel so tired and weak that I would not even have the energy to get up from bed. I didn’t know how to handle all that. I kept asking God – Why me? I remember asking this question to my psychologist. She told me that, “Our biggest challenges are our greatest blessings in disguise.” I could not make any sense of that at that point in time. I decided that I will not let my predicament affect my studies. I completed a course in Engineering and found a job in a fortune 500 company. Things were fine but there was something missing in my life. During that time I saw an advertisement in the newspaper. An NGO was looking for some volunteers for a telephonic counseling helpline service. I applied there and took an evening shift. After work I started going there. I loved the experience of talking to people over the phone and helping them. I decided to quit my Engineering career and I joined a Call Center. My parents and friends thought that I had lost my mind; however, I followed my heart. Talking to so many people over the phone and helping them was fun. For some time everything were fine but things were supposed to happen in a unique way for me. One day at work, a trainer who was supposed to take a session fell ill and there was no one else to take that session. When I got to know about this I asked my supervisor if I can conduct that session. She was all right with that. I was little anxious but I gave my best shot. 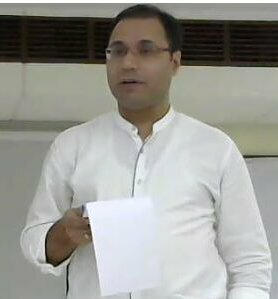 The session went very well and I received very good feedback from the participants. Within three months I applied for a job as a Soft Skills Trainer and I got it. I loved the feel of conducting training sessions and my work became my passion. I felt nice that I was bringing a change in other’s lives. Side by side, I did my MA in Psychology, MBA in HR and a course in Training and Development. While I was undergoing progress in my professional life, my personal life was still being tormented by the Bi-polar demon. In the year 2006, my mentor, Chitra Ravi (www.seedtlc.com) suggested me to attend Transactional Analysis 101 by Dr. Pearl Drego and Fr. Oswald. It had a profound affect on me and I found the stepping stone to combat Bi-polar disorder. I did numerous other courses like Reiki Healing, Angel Therapy, Aroma Therapy and they helped in to some extent. I attended NLP (Neuro Linguistic Programming) by Dr. Richard Mchugh in the year 2011 and as if someone gave me answers to all my questions. My belief that I had to live with the Bi-polar disorder for the rest of my life got thrashed and I got a new life which was more stable and full of serenity and joy. It took me time to understand and realize that had it not been Bi-polar disorder I would never have studied psychology and pursued a career in training and counseling. Life is always beautiful. When the dark clouds surmount the sun, we just need to look at the silver lining.